The Pervert’s Guide to Cinema is playing occasionally, here and there, and should be available soon on DVD. You can read the full review in this week’s “The Screener” column at PopMatters. One of William S. Burroughs’ more famous quotes concerns the meaning of the title for Naked Lunch. No matter that he was probably just winding up the interviewer, Burroughs still captured a shiver of dread when he explained it as being “the frozen moment when everyone sees what is on the end of every fork.” The line may not be appropriate for the entire opus, particularly when one is talking about Mugwumps, but it’s nevertheless a feeling that everyone is familiar with. It’s that second in time when the scales fall off and you see the world—or, more often, a particular corner of it—in a completely new way, as though for the first time. Nicholas Geyrhalter’s film Our Daily Bread is a 21st century naked lunch in the true sense of what Burroughs meant, not a scattershot impressionistic sensory assault, but an eye-opener that can actually change the way one views the world. At least part of it. 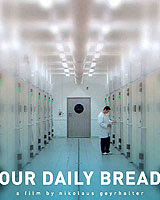 Our Daily Bread is now finally available on DVD. You can read the full review at this week’s “The Screener” column at PopMatters. 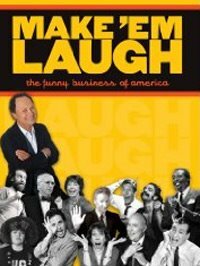 Make ‘Em Laugh is now available on DVD. You can read the full review at PopMatters. You can read the rest of this week’s “The Screener” column — about the Golden Globes, Slumdog Millionaire, The Dark Knight, and other sundry items — now at PopMatters. Cherry Blossoms (aka Kirschblüten – Hanami) is in very limited release now. The full review is at filmcritic.com. With his bifurcated status as Hollywood powerhouse and indie maverick, there are few directors besides Steven Soderbergh with both the creative chops and the stubborn drive to make a film like Che. A more mainstream director would feel forced to smooth the political edges, and a more resolutely indie director might be tempted to make a retro-propaganda film about Che Guevara, all fluttering flags and poster-ready stalwart revolutionaries sweeping the capitalists from power. 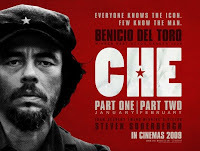 Che is now playing around the country, both together and as two films. You can read the full review in this week’s “The Screener” column at PopMatters. PW Comics Week just put out their third annual critics’ poll, which they were nice enough to ask me to take part in. While you can never quite definitively say what are the best graphic novels in any given year, this is a nicely weighted listing of titles that are pretty much all guaranteed to be worth your precious time and money. 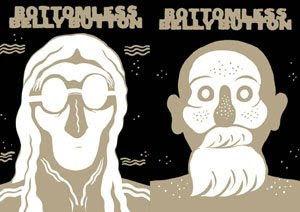 The winner, not surprisingly, is Dash Shaw’s Bottomless Belly Button, a phantasmagorical piece of work that had critics around the country gobsmacked with admiration. Other notable mentions include the creepy-as-hell Three Shadows by Cyril Pedrosa and Mia Kirshner’s I Live Here.